Asta Online is a 3D Fantasy MMORPG set in a world torn between two warring factions. Begin your quest to save the world of Samsara from the Evil God’s destructive forces that are pouring into the land from all over. Play as one of 5 classes that can be customized to your precise liking through enhancing the stats in any way you choose. Pick your talents between two separate trees that are different from every race and class, even if the class is shared between races. Join the amazing arenas and battle against other players in team, single, or even class based combat. The world is at your fingertips, which side will you help to prevail? Once you log into the game, you’re instantly greeted with a familiar scene (if you’ve played Rift, Tera, SWTOR or other “two-warring-factions” games). To begin the creation of your own character, you have to first choose a faction betwen the Asu and Ora. After selecting the faction you wish to serve and fight for, you get to choose which race you will play as. Each faction has 3 playable races, one gender locked to male only and two that are both genders. While there are 5 classes that are playable, the only race that can utilize complete freedom of choosing which class you want is the Human race. The other two races will have the option of only 2 of the playable classes. The classes for the other two races are different between the two factions, so sorry if you were wanting to be an Elven archer as it’s not possible on the Asu side at least. After selecting your faction, race, and class, you finally get to customize your appearance to your liking. The options are pretty limited, and I was disappointed to see there were no body sliders, but you’re given a small set of options to change and fine tune however you see fit. 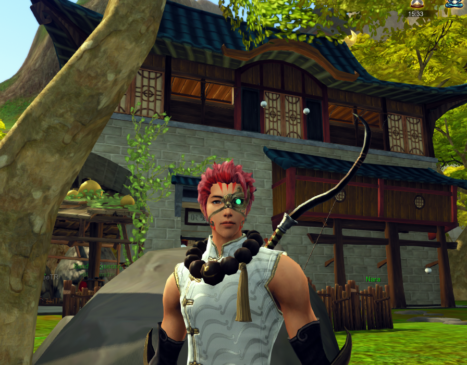 For me, I decided to be an archer with fiery red hair to match his final class armor. After creating your character, you get an epic English dubbed cut scene showing you what happened and why you start where you do. This scene shows the heroes of Samsara rising against the Gods which leads to the division of the world into the two factions. Since you were part of this rebellion, you are also thrown down from the heavens without any remorse from the gods, meaning all your memories are destroyed. Depending on your faction, you’ll start in a continent with the other races of that faction and begin your journey. The Asu continent is lush, green, and full of thriving life while the Ora continent is dark, damp, and gloomy. The differences are only in appearance of scenery as the two continents are exactly the same in terms of landscape and structural features. You’re immediately put to use by helping out various NPC’s who are struggling against some small time invaders and other problems they for some reason cannot finish themselves. Not Just the Factions are Familiar! 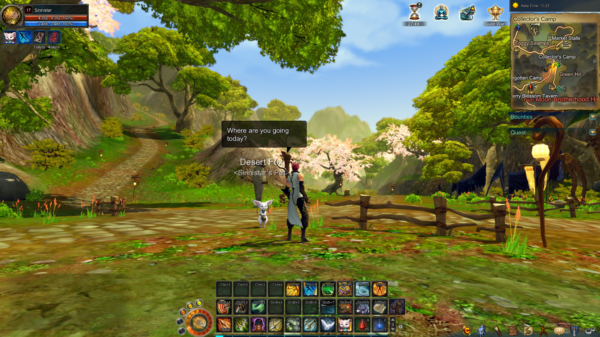 If you’ve played a bunch of older MMORPG’s like myself, then you’ll immediately notice several similarities to many of the earlier titles like Perfect World International, World of Warcraft, Aion, and so on. For me, I noticed the background music since it’s pretty much ripped from PWI and WoW. The gameplay mechanics are also extremely similar to WoW, and there is a similar art style to that game as well. Not surprising, as this game was dubbed an “Asian WoW” game awhile back. The controls are pretty much the same basic controls of earlier MMORPG’s. You use WASD to move, Q and E to turn your character (or hold right mouse button), and tab targetting. Your skills are tied to hotbars that you can extend more of if you need more room (similar to PWI with up to 6 hotbars). Levelling up and progressing through the game starts off pretty quick. You get more than enough quests to get you through each level and Public Events are pretty much always up and repeating, so there’s no shortage of ways to gain XP. As the player levels up, they gain 5 stat points they can add into any of the 4 basic stats: Attack, Vitality, Impact (Critical Rate), and Energy (MP Casting Time). The skills the player gets are automatically unlocked as they level up and auto-assigned to the next empty spot on their hotbars. The skills are also ranked up at certain levels, making the early skills useful even at the end game. There are quite a few skills for each class and none are useless, so it works out well for those who enjoy having a plethora of skills at their disposal. For those who don’t like the hassle of managing multiple buttons, there is a nice little macro system that allows you to assign up to 5 skills to a single button! 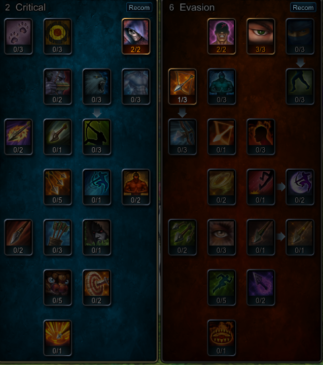 The talent trees for each class are determined by their faction and race as well as their main class. What the talent tree does is allow the player to specify their playstyle even further. For example, as an archer I am able to choose between an evasion based build or one that allows me harder hits with less hate generated. Archers have stealth, so you can “Pew Pew” from the shadows, especially if you decide to build your character for that. These are basically sub-classes for the main class you choose. You’ll gain a talent point every level after 10, so you can currently get 20 total points into either side or both sides. You aren’t locked to only choosing one side, much like how WoW’s talent tree works as well. This provides you the means of making the character more like the one you want to be. Choose to copy others, or make one that’s so unique that even they will copy you! Here’s where the fun begins. In Asta Online, there are multiple PvP types. First, you have the Open World Faction PvP. This type is straight forward: You fight for the glory of your faction against the other one. This can happen literally anywhere except in the safe zoned cities and only needs to be initiated by simple running into someone from the opposing faction. The second type is another commonly known type, Duels. Everyone should know what duels are by now, but if not, it’s simply a 1 versus 1 combat to see who is better at PvP (or better at paying real world cash in many cases). Again, these can take place anywhere and this type isn’t bound by faction so anyone can duel anyone. Next are the other three types. I put these together because they’re all basically arenas. The first type of arena is the Solo arena, which is like a duel but you que up for it and fight in an arena instance instead of the open world. The second arena type is the Team arena where two teams of 3 or 5 players will fight it out in various scenarios like “Hold the Point” and “Deathmatch” modes. The last type of arena is the Battleground which is a much larger battle between two groups of 20 or 50 players competing in the same modes are the team arena. The PvP is pretty simple and doesn’t really offer much uniqueness to it, but it can still be fun if you’re with a good enough group or if you’re good by yourself. The cash shop doesn’t play too big of a role in determining who the victorious team is in this game, thankfully, but it can give the players who make full use of it a slight advantage in gear enhancements over the free players. 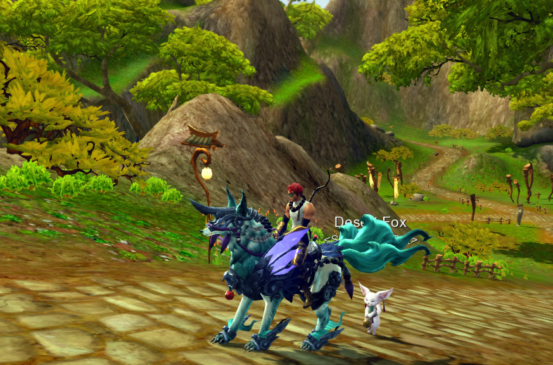 While Asta online is still a new MMORPG, it houses many players already and offers them a fun playing experience. 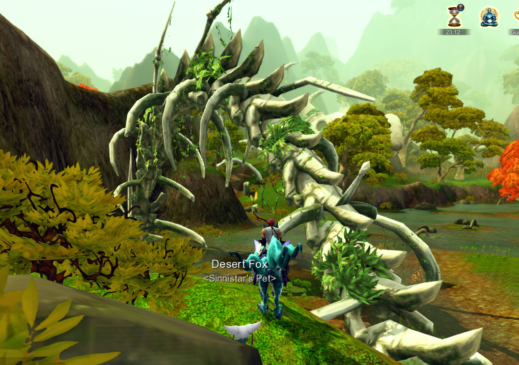 You get to choose what mounts you want to use early on (even as a free player) and nothing is overly complicated so progression is quick and not stressful. The game’s world is beautiful and shows a lot of time put into its construction. The game’s lore also plays a large part in what is happening around the world of Samsara and why things are as they are. Overall, the game is enjoyable, but I recommend playing with friends as the grindy part of levelling can be really repetitive. You can do dungeons alone, but the rewards are not as good as in a group. And lastly, there is a LOT of places to explore and you can play how you like by doing several different things from crafting, bounty hunting, fishing, to even owning your own little house. If you’re into Fantasy MMORPG’s and are looking for a “Not-so-WoW, WoW look-a-like game” then Asta Online is a good runner up. For me, this game is easily a 7.8/10.